Background: Intraoperative hypothermia during both open and laparoscopic abdominal surgery may be associated with adverse events. For laparoscopic abdominal surgery, the use of heated insufflation systems for establishing pneumoperitoneum has been described to prevent hypothermia. Past studies have shown inconclusive results with regards to maintenance of core temperature and reduction of post-operative pain and recovery times. 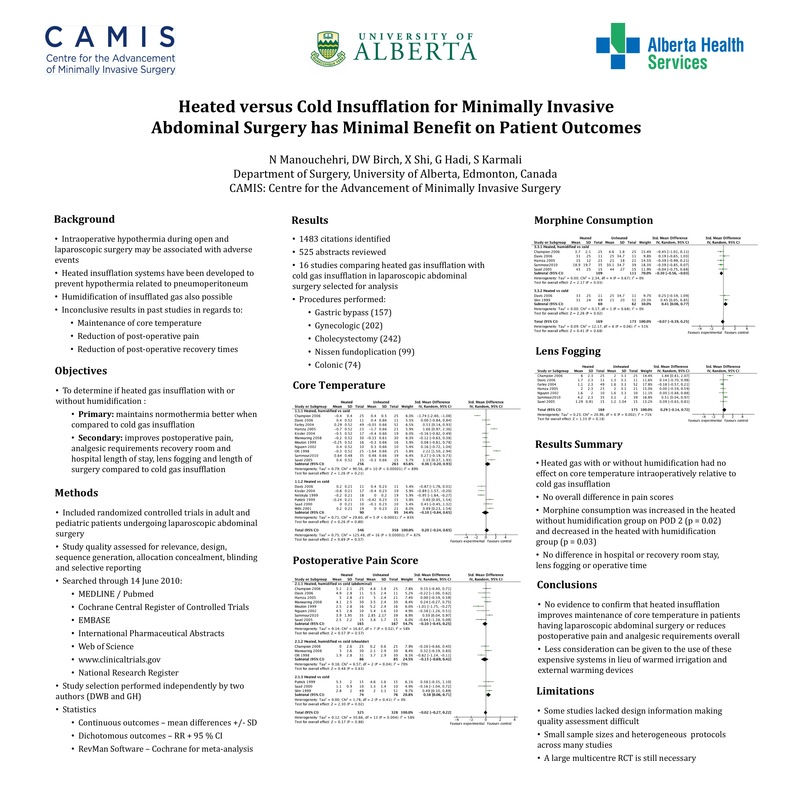 Objective: To determine the effect of heated gas insufflation on patient outcomes following minimally invasive abdominal surgery. Methods: Medical online literature published from 1956 to June 2010 was reviewed resulting in the selection of randomized trials comparing heated (with or without humidification) gas insufflation with cold gas insufflation in adult and pediatric populations undergoing minimally invasive abdominal procedures. A systematic review with meta-analysis was performed and results were presented using mean differences for continuous outcomes and relative risk with 95% confidence intervals for dichotomous outcomes. The estimated effects were calculated using latest version of RevMan software, provided by Cochrane web site. Results: Sixteen studies were included in the analysis. During laparoscopic abdominal surgery, no effect on postoperative pain, core temperature change, morphine consumption, hospital length of stay, lens fogging, operative time or recovery room stay were appreciated with heated relative to cold gas insufflation with or without humidification. Conclusion: The study offers evidence that during laparoscopic abdominal surgery, heated gas insufflation, with or without humidification, has minimal benefit to patient outcomes.